2011 was a tough year for the U.K.’s biotech industry, especially with several big pharma closures. The good news is that there is new growth in development and manufacturing of biotherapeutics. Pfizer and Novartis may have shut down their U.K. sites, but as the saying goes, when one door closes another opens. GlaxoSmithKline is evaluating putting a significant biomanufacturing site in the U.K., and Lonza, Fujifilm Diosynth Biotechnologies, and Eden BioDesign are all increasing their capacity in the U.K. The recent “bioProcessUK” conference brought a cross section of the U.K.’s biotech industry together to reveal even more hope for the future. “This year we estimate at least 500 new jobs have been created in bioprocessing,” stated Mark Bustard, Ph.D., head of bioProcessUK at the HealthTech and Medicines Knowledge Transfer Network, a U.K. government initiative. The U.K. is also showing a strong pipeline for biopharmaceutical development. According to Dr. Bustard, the U.K. has at least 205 innovative medicines in development with companies such as Reneuron making good progress with its cellular therapy to treat stroke patients. Launch a £180 million ($278.6 million) Biomedical Catalyst Fund to be overseen by the Medical Research Council (MRC) and TSB. The fund is designed to help startups navigate the “valley of death” between the development of a new drug in the laboratory and the point when it comes to market. Spend £130 million ($201.2 million) toward personalized or “stratified” medicine research. Create a £50 million ($77.4 million) cell therapy technology innovation center to exploit the promising technology commercially, by spending £10 million ($15.5 million) a year over each of the next five years. For a full analysis of this strategy, click here. Having bioprocessing capacity is vital to being able to keep pace with demand for antibody therapies—and, in the future, cell therapies. “The total global demand for monoclonal antibody products was approximately 8 metric tons in 2010, which we expect to grow to approximately 13.4 metric tons by 2016,” said Howard L. Levine, Ph.D., president and principal consultant at BioProcess Technology Consultants. “Demand for the top five selling monoclonal antibody products will range from one to two metric tons each, helping to drive an approximately twofold increase in demand for cell culture capacity between now and 2016. Dr. Levine believes that the development of newer, more potent product types such as antibody drug conjugates (ADCs), which require less antibody concentration per dose, may lower the demand for mammalian cell culture capacity, as these products will require smaller facilities to produce. One of the U.K.’s strengths is in delivering technology to improve development and manufacturing of antibody therapeutics. 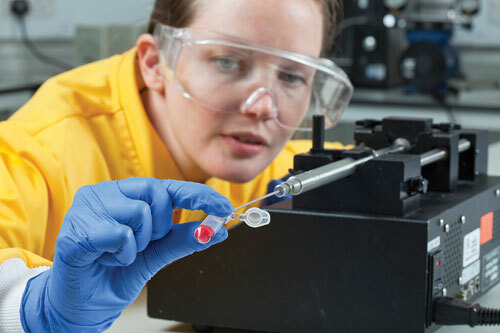 The U.K. has capacity and specialist expertise in ADCs, and it’s where some U.S. pharmas and biotechs, including ADC heavyweight Seattle Genetics, are actively choosing to have their antibody conjugation processes performed. Two companies that illustrated this technical strength at the conference were Oxford BioTherapeutics and Kymab. Harry Lamble, Ph.D., director of business development at Oxford BioTherapeutics, presented his company’s use of its Oxford Genome Anatomy Project (OGAP®) database, a discovery platform that integrates proteomic data on three-quarters of the human proteome, with genetic and clinical information across 50 different human tissue types and 60 diseases including 25 forms of cancer. “Using the information in our OGAP database in collaboration with a number of antibody technology firms including BMS, Amgen, and Alere, we have generated novel antibodies to treat cancer,” said Dr. Lamble. “A number of our lead programs are currently in preclinical development, including ADCs to treat gastric, lung, and other cancers.” Dr. Lamble showed mouse Xenograft data for two programs, which demonstrated that a single 2 mg/kg dose arrested tumor growth during the period of observation in established disease models. “We view ADCs as transformational and recently entered a collaboration with Seattle Genetics to develop ADCs. Seattle’s recent successes with its ADC—Adcetris for treating Hodgkin lymphoma—indicates that this class of drug could be highly efficacious for treating cancers,” Dr. Lamble concluded. Tom Shepherd, Ph.D., chief business officer at Kymab, a spin-out from The Wellcome Trust Sanger Institute in Cambridge, presented interesting information on his firm’s transgenic mouse platform, Kymouse™. According to Dr. Shepherd, of the nine fully humanized monoclonal antibodies marketed as therapies, seven are derived from transgenic mouse platforms. Subsequently, Regeneron learned from Abgenix and Medarex and kept the mouse constant region, added more human gene diversity, and ensured the gene integration was in the right place, but the lambda light chain was still missing. Therefore, these earlier mice don’t provide the full spectrum of functional human immunoglobin diversity. In addition to Kymouse, Kymab is also making a new ES cell bank from Kymouse, which it will use to make knock-out and knock-in mice for specific drug targets. 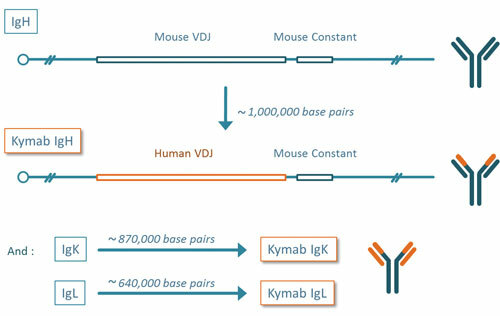 To encompass the entire functional human gene repertoire for the variable regions of antibodies, Kymab is inserting over 2.5 megabases of DNA into the relevant mouse loci. Another area where the U.K. is beginning to gain expertise is in the production of stem cells to GMP standards, with facilities being developed at a number of sites. These include the U.K. Stem Cell Bank at the National Institute for Biological Standards and Control (NIBSC), an operating center of the Health Protection Agency, and Roslin Cells. Aidan Courtney, CEO of Roslin Cells, added, “We were initially set up to provide undifferentiated clinical-grade cell lines, but have since extended our activities to include assisting research groups in translating their protocols to GMP. Having recently moved to our new facility at the Scottish Centre for Regenerative Medicine, we are now looking to manufacture advanced therapy medicinal products cells in 2012. “When working on the translation of a new cell therapy, it is invariably the case that GMP and scale-up need to go hand in hand. It’s vital to have a clear idea of how the cells will be used from the outset, as the characteristics of the cell therapy—the quantity required and how they will be delivered—will determine the process development,” he continued. Speakers at the conference were upbeat and agreed that the U.K. has a strong SME base for bioprocessing, as well as academic hubs of excellence at Cambridge, Manchester, Loughborough, Nottingham, and Leeds, all establishing knowledge transfer hubs. University College London (UCL), Kent, and Imperial College are also creating technical strategies in key bioprocessing niche areas. Many stated that this sector needs funding schemes such as BRIC (Bioprocessing Research Industry Club) and an environment for business innovation to ensure that research can be translated from concept to commercialization. “We need the sustained support of the U.K. government in terms of generating the right fiscal policy. Initiatives such as the ‘patent box’, which intends to introduce a 10 percent tax rate for profits arising from patents, will certainly help,” Bustard stated. UCL’s Mike Hoare, Ph.D., said, “Academia and industry are really pulling together in the U.K. bioprocessing field, and the introduction of BRIC has been a great success. By working together we have been able to enlighten politicians on some key issues, and it has squashed this idea that industry must necessarily be the sole funder of activities relevant to product manufacture. “The next generation of biological therapies are going to be more complex, and we must understand the fundamentals of scale-up, so it’s important to grow government funding for this research,” he continued. “We have wonderful mechanisms, especially through the EPSRC and the Technology Strategy Board, of interfacing academia and industry in the U.K., and we have to keep this going,” Dr. Hoare said. “We need to support U.K. companies involved in bioprocessing and provide a highly skilled workforce, but we still have a lot fewer engineers being trained here than we need for the bioprocessing industries. UCL Biochemical Engineering Technology Strategy Board and EPSRC bioprocessing research programs are creating technical strategies in key bioprocessing niche areas.